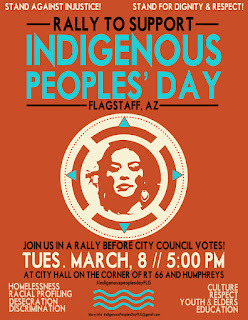 FLAGSTAFF, Ariz. — Flagstaff City Council is scheduled to discuss and vote on an Indigenous Peoples' Day proposal Tuesday, March 8 at 6:00pm. 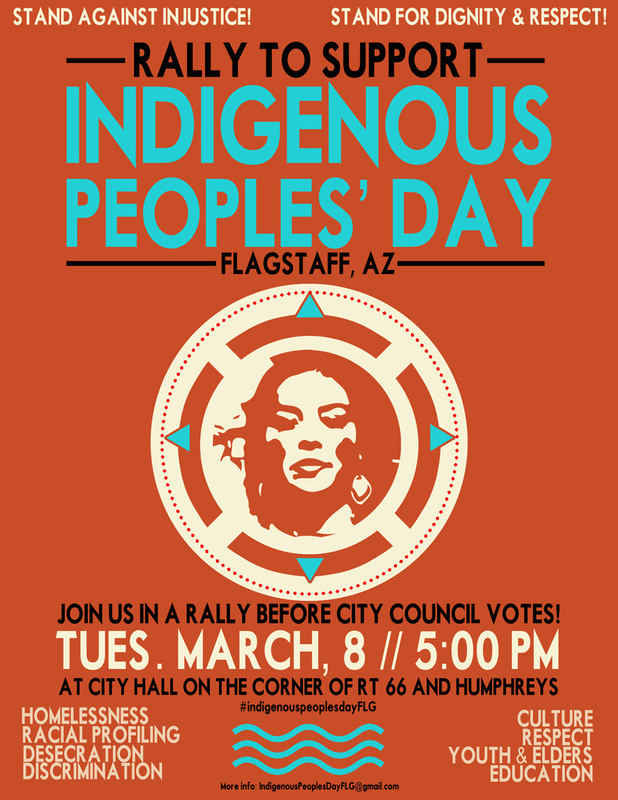 A rally to address injustices facing Indigenous Peoples in Flagstaff in support of the proposal will be held prior to the Council session at 5:00pm outside City Hall on the corner of Rt. 66 and Humphreys. What: Rally before Flagstaff City Council discussion and vote on Indigenous Peoples' Day proposal. When: Tuesday, March 8 at 5:00pm. Where: Outside Flagstaff City Hall on the corner of Rt. 66 and Humphreys. Who: Native American community members, including Northern Arizona University students and faculty, will speak to why a meaningful process towards declaring Indigenous Peoples' Day is necessary in Flagstaff. Why: Indigenous Peoples' Day has been declared throughout the country as a respectful replacement to offensive Columbus Day celebrations. Native American residents and visitors to Flagstaff face disproportionate arrests, racial profiling, sacred sites desecration, homelessness, and other issues that rarely are addressed by the City of Flagstaff. Background: Council member Eva Putzova initially proposed declaring Indigenous Peoples' Day in October of 2015 but withdrew her proposal after Indigenous community members called for meaningful action to address injustices faced by Native peoples. The proposal now includes a three step process with public hearings, reports, and a plan based on input from the hearings. Last year nearly a dozen cities across the US including the entire state of Alaska renamed Columbus Day "Indigenous Peoples' Day."